I love to bake, but it can be such a finicky process. Add too much baking soda? Your cookies are ruined. Try to substitute regular milk for buttermilk? Disaster. It doesn’t allow for interpretation the same way cooking does. That’s why Drop’s new iPad-connected scale is so compelling: It simplifies even complicated recipes down to baby steps, no measuring required. I already bring my iPad into the kitchen to replace my recipe collection and act as my spirit cooking guide. Setting up Drop’s $100 Bluetooth scale and companion app just makes my tablet even more useful. The Drop Kitchen companion app tells you exactly what you need to have on hand before you get started. Drop lacks a display of any kind, but it’s incredibly easy to set up. It comes equipped with a battery that works out of the box. Simply tap the button on the front of the scale and wait for the red LED light to flash, which means it’s ready to go. Then install the Drop Kitchen app on your late-model iPad—the original and second-gen iPads are sadly incompatible with Drop—and make sure the app is open before you try to pair your devices. If the app isn’t open, your iPad’s Bluetooth will search endlessly to find Drop and won’t be able to find it. After the small red teardrop-shaped scale is paired to your iPad, take a spin with Drop Kitchen and find some recipes you like. 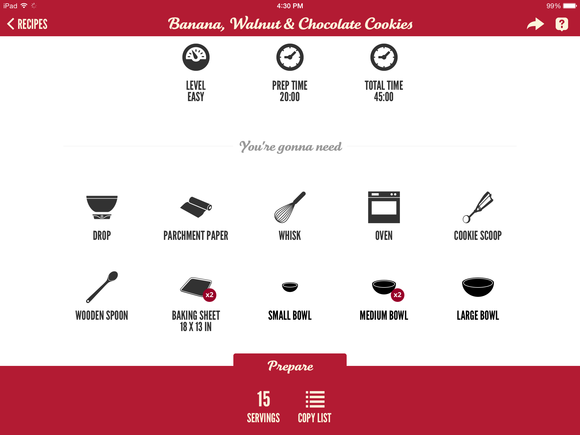 The app has tips, tricks, and step-by-step instructions for baking a variety of treats. It also weighs the ingredients you dump into the mixing bowl placed on top of the scale and displays your progress. In theory, you should never need to use a measuring utensil again. 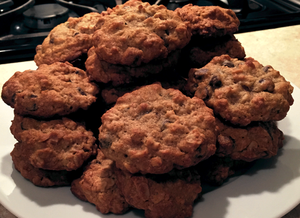 I put Drop through its paces with two of the app’s cookie recipes. At first it was a little strange that the scale lacks a display—which definitely limits its appeal—but as you start spooning and squeezing ingredients into the mixing bowl, watch as the app reflects in real-time how much you’re adding. A dotted line marks the target weight, so keep adding ingredients until you hit the mark. Just make sure to zero out (or tare) the app so it doesn’t take into account the weight of the bowl or the other ingredients you’ve already put in it. These banana chocolate walnut oat cookies were a huge hit at my dinner party. I made very basic chocolate chip cookies first and then more complicated confections with banana, oats, chocolate chips, and walnuts, both without any measuring cups or spoons. (OK, I did use a 1-cup measure to scoop out flour, but otherwise I would’ve been covered in a fine white dust.) The app recognizes when you’ve added enough of an ingredient and proceeds on its own to the next ingredient card. In some cases I needed to manually tap to move ahead, but you can tap the scale’s button instead of your iPad to avoid smudging its screen. 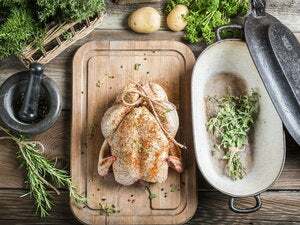 One of Drop’s stand-out features are its ability to scale recipes up or down depending on the amount of ingredients you have on hand or servings you want to make. 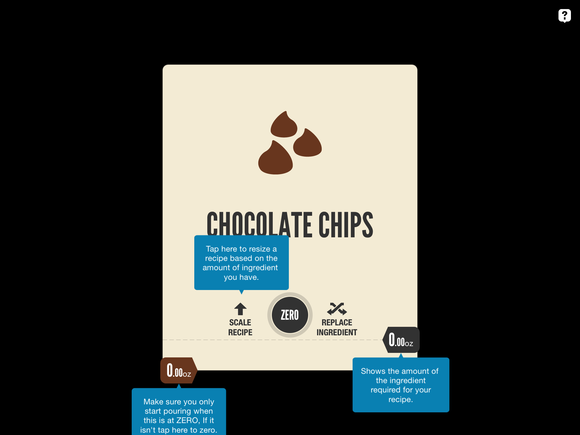 Only have 4.2 ounces of chocolate chips instead of 6.2? Weigh out the ingredient with Drop before you get started and it’ll adjust the amounts of every other ingredient accordingly. The app details everything you need to have on hand, including utensials and ingredient ounces, so you the app can help you adjust a recipe before the mixing begins. Once things start happening in the kitchen, you’ll be grateful you set out every utensil and every ingredient in advance. My Drop experiments were overall successes. The chocolate chip cookies were a little too large and a little underbaked, but that was my fault—I was a little distracted shooting this video. But my coworkers scarfed them down in seconds. My second attempt went smoothly. The three batches of cookies I baked for a dinner party were such a hit that my guests were asking for Drop demos. Scale a recipe down by weighing out a dwindling ingredient before you get started. One feature that I couldn’t wait to try but wasn’t available yet was the ingredient substitution option. Tapping to substitute an item you’re out of results in a “coming soon” message, so I was disappointed I couldn’t use it when I had no idea where to procure cacao nibs. I’m also looking forward to the day when you can upload your own recipes or import ones from other sites/apps. For now, you can only choose from the app’s recipe database, which, to be fair, is constantly growing. Bakers in the market for a digital scale probably won’t turn to Drop if only because it lacks a display. You can’t just weigh an ingredient without going through the whole process of selecting and making a recipe—serious chefs don’t have time for all that. I am certainly no expert but I do enjoy baking when I have time, so Drop is the perfect tool for me. It’s small and takes up no space at all in my Brooklyn kitchen. It keeps my iPad from looking like a toddler smeared her food all over it. It results in delicious treats. There are other connected scales, like the $70 Perfect Bake, that are cheaper and give you a little more bang for your buck. 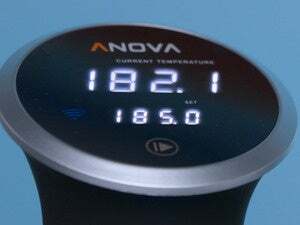 The Perfect Bake includes a digital display, three mixing bowls, an oven thermometer, and an iPad stand out of the box. But it also lacks Bluetooth and needs to be connected to your tablet via a wire that has to be plugged into a headphone jack. That’s not exactly convenient. If you have $100 to shell out on another gadget and want to step up your baking skills, Drop will definitely guide you in the right direction. Serious bakers can skip this scale. 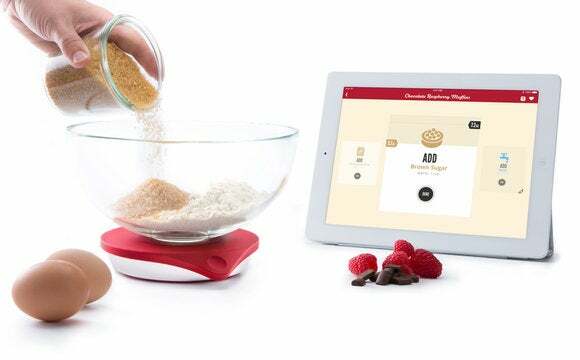 Baking with your iPad in tow just got easier with this Bluetooth scale, even if it is a little pricey.